Shrimp, Spinach, Ricotta in a Lasagna all surrounded in a delicate tomato and white wine sauce. The crushed tomatoes blended with white wine was just the right liquid and kept it from drying out while cooking. This meal took very little time to prepare after I worked a 12 hour day. The combinations of shrimp, spinach and ricotta blended nicely together and the seasonings were perfect.We were all very happy with the results. This was a first time trial for all of us, and I will definitely be making this again soon. I was a little worried with my crowd, we are a little out numbered by meat lovers here. My two sons and husband, were amazed how much they liked this with the shrimp, and spinach instead of meat and ricotta as our usual, this was a nice change. This is ready to go into the oven, smothered in lots of cheese. Put in a hot oven, 350. Bake for about an hour and half. Sauce is on top of the noodles, add shrimp, salt pepper, I sprinkle a little garlic powder and more red pepper for a spicier shrimp, top with more noodles next add sauce and mozzarella. Add the seasoned spinach, then mozzarella, more noodles and sauce, mozzarella. Add the seasoned spinach, then mozzarella, more noodles and sauce, mozzarella. After spreading sauce on this layer its ready for the spinach filling. The first layer is ricotta that is mixed with egg, parsley and cheese. I like to leave this layer white so I put some sauce on the bottom of the pan, spread the noodles, then ricotta, more noodles then sauce. You will need mix some of these ingredients in separate bowls to prepare for layering, so they are seasoned before cooking all together. Take the two cans of sauce add half the spices ( except red pepper flakes) add wine and one tablespoon of minced garlic, stir together. Stir to combine. Set aside. In a large separate bowl, mix ricotta, parsley and eggs set aside season with salt and pepper. Thaw spinach and drain, squeezing out water. In a bowl add 1 tablespoon minced garlic, olive oil and red pepper flakes mix together set aside. In a 13x9 pan that is oil sprayed, line with lasagna noodles. Spread the ricotta mixture on the top. Add another layer of noodles laying in opposite directions, top with sauce and mozzarella. Add spinach next, more cheese and grating cheese, red pepper flakes, then more sauce. Add noodles next, again change direction placement of noodles ,add on this layer mozzarella then shrimp . Finish last with remaining noodles on top, add more sauce then grating cheese. Sprinkle with parsley, oregano, basil and rest of mozzarella cheese. Bake at 350 for an 1 1/2 hours cover in foil for the first hour. Remove foil and let the cheese brown for the last half hour. 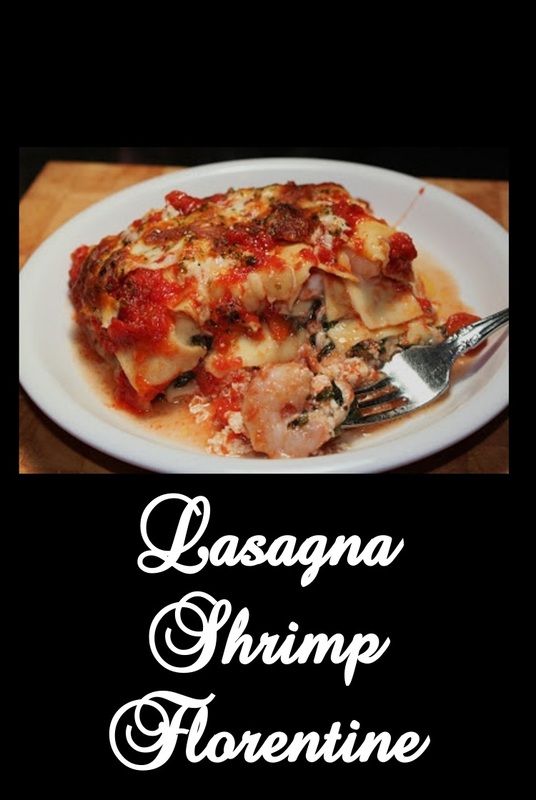 Oh, we definitely love shrimp and lasagna...looks like a winner to me! Love the mix of flavours!! what a great way to use seafood!! A very unique lasagna! I love the shrimp in it! Oh so lovely. Adore shrimp Adore spinach. Like the ease. I'm hooked. Oh my gosh! This looks and sounds delicious!!! Love that lasagna and your mix of ingredients! Yum! Now this is one lasagna I would love to eat. When will the next batch be ready Claudia? Claudia, please deliver one pan right away, I will email you my address!!! This is a fabulous lasagna recipe friend! This is an incredible combination of flavors. The shrimp must add a richness to it that has to be incredible. Great recipe! I'm happy for the result but I would be happier if I had eaten it! I never thought to put shrimp in lasagne. I usually just made traditional, but this is a great spin...especially a great change from beef. as always looks amazing!hows your back? What a delicious looking lasagna! And so unique! I love it. No way! You made this after a 12 hour day??? You are my HERO. That's incredible. I would have collapsed and warmed up a can of soup. You know, I never preferred meat lasagne even when I ate it, I much prefer the veggie kind, so this would be right up my alley. Another awesome masterpiece from your kitchen! I just made this but am not a great cook and so I added all of the sauce to the first layer. It also doesn't say when to add the shrimp (or did it). So I added it between layers. I used a store bought sauce on the top layer and just took it out of the oven. Other than that I followed the exact instructions (whomp, whomp). I will let you know how it turned out after it is cool enough to eat. It looks fantastic. Also I used raw shrimp (whomp, whomp). Well I promised to follow up... this was absolutely fabulous even with my mistakes! My family including my 3 very picky grandchildren gobbled it up. It was restaurant worthy! I will be making this often and of course next time will make it correctly. Thanks for a wonderful recipe. So, I tasted this finally. OMGOSH, it turned out fantastic. Despite some of the changes I had to make and that I chose to make to tweak to my taste, this was a brilliant recipe. I was overwhelmed by how good it was, and would recommend it to anyone. Thanks again for the share! Also, I made this open-faced to reduce the amount of pasta. Rather than top the shrimp with sauce, I topped them with stewed tomatoes and the cheese as per the recipe. It worked wonderfully! Incase anyone is interested.